Mark and cut all at once. Once installed on your saw, you can cut to a desired length without stopping to mark your wood. It never gets in the way with its extremely flexible rod, will not crack, break, nor get in the way. With it's detachable feature you can remove it on the fly and throw it in your back pocket or in your saw box for later use. Adaptor is made of alloy steel and will hold up to the constant use. 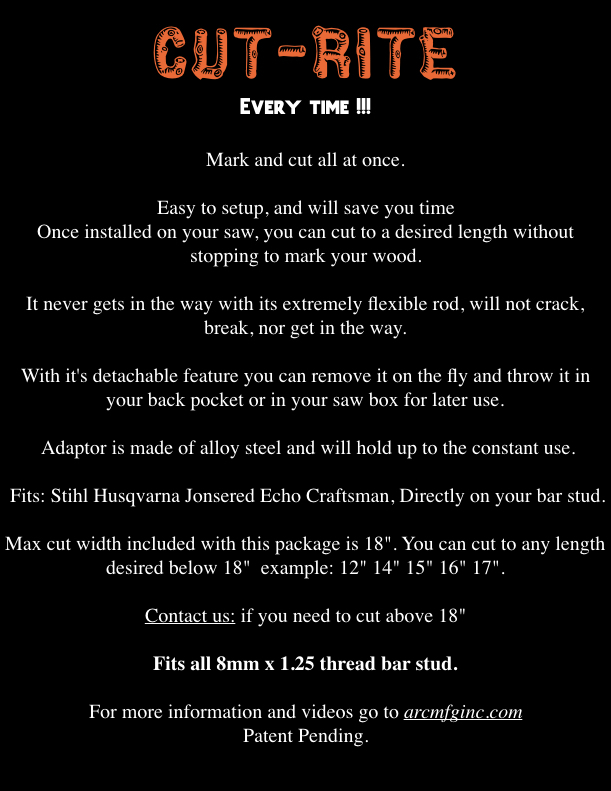 Fits: Stihl Husqvarna Jonsered Echo Craftsman, Directly on your bar stud. Max cut width included with this package is 18". You can cut to any length desired below 18"
example: 12" 14" 15" 16" 17". Contact us: if you need to cut above 18"
Fits all 8mm x 1.25 thread bar stud.